Image used under Flickr Creative Commons license from NASA Goddard Space Flight Center. A quick Google search will tell you a few basic facts about Alaska: it’s the biggest state in the country and it used to be part of Russia. Chances are, you already knew that. But this land of midnight sun, glittering glaciers, and endless coastline contains much, much more to boggle the mind and make jaws drop. Share a few of these interesting tidbits on any excursion, and we guarantee you’ll have your tour guide nodding with enthusiasm at your Alaskan street cred. He might even learn something new! 1. 85% of the highest mountains in the United States (17 out of 20) can be found in Alaska. From Denali to Mt. Hunter and with Mt. Vancouver in between, Alaska is chock full of peaks that literally take your breath away (the altitude, remember?) What’s even more incredible is that almost all of the highest peaks within Alaska are located in a single area – the St. Elias and Wrangell mountain ranges. 2. Kodiak bears can only be found, well, in Kodiak. Alaska is the proud home and habitat of the only brown bear subspecies in the world. Ursus arctos middendorffi are the largest bears in North America and evolved all on their lonesome after being isolated on Kodiak island 12,000 years ago as the last ice age came to a close. Just goes to show that mammals in Alaska have always been able to roll with the punches. 3. Most of the country’s active volcanoes live here. Like everything else in this state of extremes, when one of the Alaska’s 130 catalogued volcanoes or volcanic fields decides to blow, the motto really is “Go big or go home.” Three quarters of the eruptions occurring in the United States over the past 200 years have been in Alaska, and a whopping 50 volcanoes have erupted since recording began in 1760. 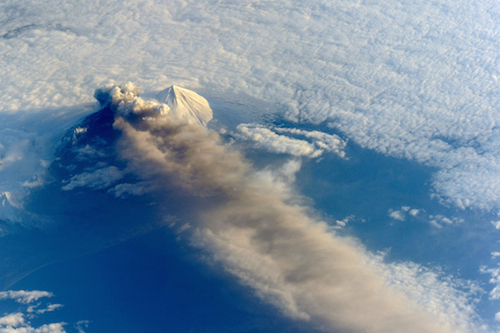 This includes the biggest eruption of the 20th century on earth on remote Katmai. Gulp. 4. The most lakes, too. Alaska isn’t just satisfied with having the most skyscraping peaks and volcanic activity in North America. It’s also crammed with the most lakes. Make that 3 million of ‘em, including Lake Iliamna, which is topped only by Michigan and the Great Salt Lakes in the lake heavyweight bracket. 5. Most people thought acquiring Alaska was a ginormous mistake. It’s hard to believe now, but when U.S. Secretary of State William Seward signed a treaty to purchase the lands that would become Alaska in 1867 for a thrifty 2 cents per acre, the rest of Congress nearly laughed him out of Chambers. They referred to the fiasco as “Seward’s folly” and the president’s “polar bear garden.” After the treaty squeaked through the Senate by the hair of one vote, the 1896 gold strike in Alaska meant that detractors were soon forced to eat their words. 6. Almost one third of Alaska’s land is in the Arctic Circle. Feel that? That’s the chill of some of the coldest areas on the continent. Located just above the Arctic Circle, a temperature of -80 degrees Fahrenheit was clocked at Prospect Creek Camp in 1971, the still-standing record low temperature for the United States. Not surprisingly, no one currently makes his or her home in the subarctic climate of Prospect Creek. 7. Dog mushing isn’t just a sport. Sure, the Legislature adopted mushing as the official state sport in 1972, but using sled dog teams to transport goods and people long predated the arrival of Russian and American pioneers to Alaska. Alaskan natives have used mushing as a primary form of transportation across the snowy tundra for centuries. When the gold rush hit and the demand for overland hauling increased, rumor had it that not a stray dog could be found on the streets of Seattle—they’d all been shipped north. 8. Alaska is pretty empty. It should be a no brainer that Alaska is the least densely populated state. After all, the state boasts 663, 300 square miles of land for a mere 742, 295 residents. This puts the state’s population density at scarcely over one person per square mile. To put this in terms you can visualize, if NYC shared Alaska’s population density, only 16 people would be living in Manhattan. Imagine how easy it would be to find parking! 9. You can go to the beach on three different seas and never leave Alaska. So, these may not exactly be the kind of beaches where you pull up a lounge chair and park a beach towel, but you can see an astonishing variety of coastline here. To the south, the Gulf of Alaska cups the Pacific Ocean. To the north, the Arctic Ocean stretches onward into the North Pole, and to the west, the Bering Sea separates Alaska and Russia. Don’t miss a whale watching or kayak tour to check these out! 10. A lot of high fliers live in Alaska. It makes sense in a state where only 20% of the landscape is accessible by road that people go by plane instead. In fact, private plane owners and small charter planes are a huge part of Alaska’s transportation system (something had to supplement dog mushing, after all). This means that the highest number of pilots per capita make their homes here of any other state, and that 1 in every 78 Alaskans is also a pilot, according to a 2005 survey. High fliers, indeed. 11. Most of Alaska’s 100,000+ glaciers remain nameless. Encounter one that speaks to you, whether in one of Alaska’s stunning bays, decorating an icy slope, or existing in an awe-inspiring ice field? Why not take a stab at naming it yourself! 12. Forget-me-nots are the state flower. It’s pretty hard to forget Alaska, after all. To experience these wonders up close and personal this fall, check out our trip planner and get going!